Taking a bath can be much more enjoyable when there’s two of you. This sleek and stylish looking two person bathtub has enough room for two people to bathe. Since it's an unconventional walk in tub, it has a low step in height and inward swinging door to making entering the bathtub easier. Made from acrylic you will appreciate the way it holds it shine for years to come. The Companion massage has two internal seats that face each other for ultimate comfort. This specialty two person walk in bathtub comes with 28 air and water jets to massage both of you at the same time! Most hydrotherapy walk in tubs pale in comparison to all the features that come standard on this step in bathtub model. It also has several safety features and was designed with the elderly and disabled in mind. It comes with a low step in height, textured flooring, temperature control and an internal safety grab bar as well. This step in bath is where safety and luxury meet. Very few walk in tub manufacturer’s offer this wide of a variety for you to choose from. We carry multiple sizes, styles, designs and options to make your life easier. We understand you are looking to find affordable walk in tubs. If you have received a couple price quotes, you may see some of the brands can be outrageously expensive. We strive to be the perfect balance between low prices and high quality. We want you to do this project once, but don’t want you to pay too much money to do it. Several of our premium name brand walk in bath tubs are several thousand dollars less than some of the leading brands. 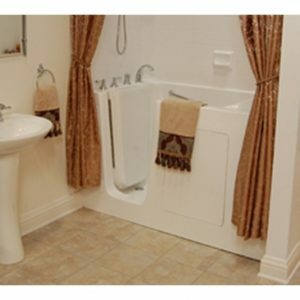 We also have some of the nation’s lowest prices on wheelchair accessible roll in showers. No matter which type of senior bathing product you are looking for, Aging Safely strives for your total satisfaction for years to come.